The Chanticleer Guest House is a tremendous find in Door County! This inn, which is a unique combination of a resort and a B&B, is in a very quiet, countryside location in Sturgeon Bay - absolutely beautiful, calm and peaceful surrounds. We spent more than an hour touring the inn with Darrin Day, co-owner with Bryon Groeschl. There are 3 parts to The Chanticleer (which is a type of rooster, by the way): The Main House offers The Guest House Suites; the Barn, offers The Guest Barn Suites - these two buildings, built originally in 1915 by a local farmer, rest on 30 splendid acres. The third part of The Chanticleer is across the road, on another 40 acres of pristine land and offers The Chanticleer Cabins - 2 built in 2000, and 2 additional ones built in 2004-2005. No wonder guests comment that they love the peace and quiet of being in the countryside. There are 8 suites in all, and 4 cabins - all have fireplaces with antique surrounds, color TVs, VCRs, CD/cassette players, private baths and a whole lot more. 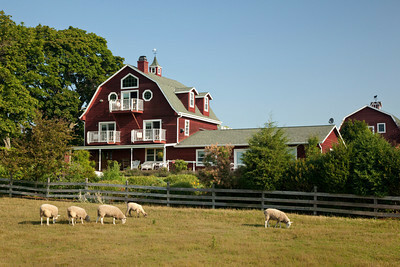 We spent a lot of time in the four Barn suites (the Barn, pictured above). When you walk into the common room, you are greeted with warmth and an immediate appreciation for the beauty of the place, as a fireplace and seating area, books, and rich elegance greet you. In the 1,250 s.f. Stable Suite (yes, there were horses kept in here at one time), you will be welcomed with a 4 poster bed, a very cozy sitting area near the fireplace, and an antique pine table. Muted floral wallpapers and meticulously appointed accessories grace this spectacular suite, which has one of the original barn walls. A large whirlpool will take the edge off any kind of day! Upstairs, there are two smaller suites of about 700 s.f. each. The Granary Suite has double French doors leading to a balcony overlooking a field. An antique armoire and 6ft carved oak headboard set the mood, as an antique pine chest serves as a coffee table, a wood and leather rocker and settee rest on the original wide honey-pine flooring, and an beautiful oak dresser with mirror welcome you. Reproduction lamps and sconces, an inviting bath with mini-floral wallpapers, a pedestal sink and shower top off this magnificent suite. Continuing upstairs, we found the Sunflower Suite, which is bright and cheerful, with muted floral beige wallpaper. A reproduction black metal bed frame, a pine armoire and antique breakfast table and chair and other period pieces make this a great, romantic suite. An there is a private balcony, accessed through double French doors! The third floor houses this 1,150 s.f. suite - which is nothing less than magnificent! Huge, vaulted ceilings showoff the original barn wood! Darrin told us that they put several layers on insulating materials on the outside so that they can retain the original barn wood, and have it totally visible throughout the suite! What a super idea that ties you right back to its barn days. The walls where the original wood is not showing is covered in floral rose wallpapers, adding a simple elegance to this rustic suite. A four-poster with canopy frame, pine armoire, and cushy, soft couches and chairs make this a suite unlike any other we have ever seen. And French doors lead out to a balcony as well. Add a well-appointed bath, antique marble-top washstand and antique dresser with mirror - and you wonder, how did they do it? This is the most expensive suite they rent (about $200+ depending on day/time of yar), but we think it is worth all of that! Fabulous! The Guest House has 4 suites as well, like The Grand Suite with pine walls and floral papers, richly appointed; the Loft Suite, Garden Suite and the Rose Suite. You will love any suite at The Chanticleer, as clearly, Darrin and Bryon have a true sense of purpose, and flair for creating wonderful room-scapes! The Chanticleer Cabins are different, but also so well done that you just have to take a step back and say, "Wow!" Built in May 2000, The Tamarack and The Hemlock cabins are luxury all the way, and face west so you get a nice sunset over the pond and trees below your porch. The latest additions, The Oak and Evergreen Cabins now complete the final stage of their rental cabin development. Both cabins have two bedrooms, two bathrooms and full kitchens. Each bedroom has a fireplace, king sized bed, cable TV and DVD players. Both master bedrooms have double whirlpool tubs with a view of the fireplace. 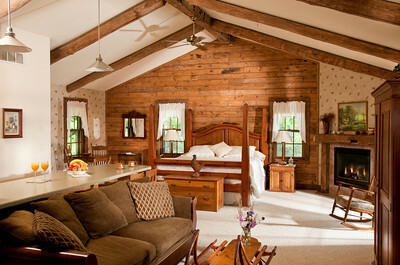 The Oak, Evergreen, Hemlock and Tamarack Cabins overlook a private wildlife pond and are situated on 40 private acres! We toured The Tamarack: four-poster of heavy pine, full kitchen, laundry facilities, gas grill, fireplace , and lots of atmosphere. 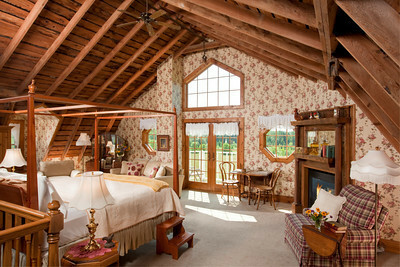 Both cabins ceiling have timbers that were once in an old granary in another part of Wisconsin. Some of the wood planks that make up some of the walls, were flooring from the same granary - nice touches of antique charm and thoughtful treatment. Both cabins, at about 880 s.f., with whirlpool tubs and all, would make a very secluded and romantic retreat. On 40 acres (though side by side), and after winding down a narrow path way off the main road, you do feel that you are in the country. And it's beautiful. The Hemlock has two bedrooms. So start your day off right with a delicious breakfast, brought to you in your room! Then wander around the grounds through the wildflowers and fields, hike, have fun, and enjoy the heated, in-ground swimming pool for all the guests! This place is fabulous! No phones in the rooms, no smoking, no pets.